Here are five of the most important questions you must answer about your business. What do you do for your customers? Why should they buy from your company? How do you negotiate price? This may be the single most important question you must answer to be successful. Define your answer not in terms of activities, but of results - results that are important to your customers. For example, staffing (such as providing temporary employees) is an activity. But results for the customer would include lower staffing costs and absenteeism, higher quality output and greater productivity, reliability, getting qualified people quickly, and a highly motivated, flexible workforce. You should focus on results that differentiate you from everyone else. Standing out in a world of many choices is critical to your success. Regardless of what you do, at some level you are delivering results to others. Your success will depend on how those people perceive the value of the results you deliver and how unique those results are. Being clear about what it is you really do for your customers is the only way you can deliver it. You must answer the question about what value you bring to the customer, what you add that wouldn't otherwise be there, and why that is important to the customer. When I first went out on my own, someone asked me what I did. I responded with "I'm a consultant," and as I said it I unconsciously raised my shoulders. I realized later that I had raised my shoulders because I really didn't have a specific idea of what I was going to do. Being a consultant covers a wide spectrum. In my former job, being a generalist was a good thing. But if I was going to solve customer problems, I needed to focus: what type of problems would I solve, and for what type of customers? A value proposition is a statement of the value you promise to deliver to a customer who purchases your products or services. It is the unique set of benefits you can deliver to a customer; it's the list of reasons the customer should buy the product or service. Because it proposes a promise, I recommend you think of a value proposition as a value promise, the promise of the value you will deliver to the customer. Thinking of this as a promise positions it in your mind with the weight it deserves. The value you promise becomes paramount in directing all of your efforts to meet that promise. A customer picks a specific product or service because of the value he or she thinks will result from that choice. The customer may or may not see all of the results as valuable, but will make the purchase if there is a favorable or compelling reason to select the seller at that time. Value is in the eye of the beholder and is very much dependent on the customer's circumstances and experiences. Value isn't limited to monetary results. The customer can value different aspects of your product or service, such as reliability, convenience, ease of use, or durability. The value that you add as an individual to the service is another part of the picture. The customer can value these attributes individually or in combination. Your value proposition should clearly explain what you do for your customers and what makes you unique or different from other suppliers. More than anything else, a value proposition can help a company focus on what it really does for its customers and what those customers really want. It is a way of thinking clearly about what the customer's priorities are. If a value proposition is based only on the seller's views about what is important to customers, it may miss the mark. A technology company may see its value as delivering technology, but do their customers see that? Or do the customers see beyond the technology to other results? The perceived value will also depend on who the customer is in an organization. What do you do to solve customer problems? How are your solutions special or unique? Keep in mind that value relates not only to the tangible and intangible benefits of your product or service but also to what your product or service does for the customer personally. That is often more important than other factors when the customer makes a purchase decision. If my job depends on whom I select as a vendor, how I think your solution will help me personally will be high on my list of considerations when I make a decision to select a vendor. I may not let others know of this, but it will be relevant. For example, the customer may want to be perceived in any of a number of ways by his or her organization: proactive, cost or quality conscious, a leader, or a tough negotiator. You must be able to understand and communicate to your customers the value that you bring. A well-conceived value proposition is instrumental to customer satisfaction and loyalty and company profitability and growth. Well-planned communication is essential for you to create and sell a compelling proposition for the value you bring to customers. One senior executive at a major company has a unique method for providing prospective representatives with his company's value proposition. Rather than simply telling them what it is, he asks them what they would expect in a relationship with a company that they would want to be associated with. They usually cite such desirable qualities as quick response time, competitive policies, strong service, and stable pricing. The executive then responds that they have exactly described his company's value proposition and then invites them to call any of the other representatives in his network. This company is quite selective in choosing representatives because it wants to maintain an extremely high level of service and it looks for the same level of commitment from its representatives. "Great value-added propositions in this world start not from liberty and license but from need and want and hunger. Breakthroughs come from limits." What is it you do for your customers? What results do you get for them? Do you have a value proposition or have you in some way described the results from the customer's point of view? If not, there is no better time than now to begin to describe your value proposition. Be sure to distinguish between the activity and the result. Describe an activity, then a corresponding result. Are you going after the same customers as everyone else? Or are you serving a different market? Who are your best customers and which ones do you serve well? Some customers are profitable: they are easy and satisfying to work with, they make decisions quickly, they pay on time, and they give referrals and return on the time you invest. Looking at the best of your current customers, the ones you have been most successful with, will give you a good idea about the type of customer you should seek in the future. If you don't have much of a customer base because you have just gotten started, think about what the ideal customer would be like. What would a profile of your best customer look like? Many years ago AOL originally succeeded by defining its market well. In 1992 it had two hundred thousand members. By 2001 it had thirty-two million members and had become a media giant by the metics of that time. AOL distinguished itself by making online services easy for the masses to use. Many of the techically astute eschewed it, but people who didn't understand the intricacies of online communication were enticed to sign up. Of course, it didn't hurt that everywhere you turned there were disks announcing that you could get so many hours of AOL free. AOL also promoted a sense of community among its members. AOL's original strategy of making Internet access easy and creating a sense of community, while effective in it's earlier days, waned in it's impact as internet users gradually became more technically savvy and AOL neglected to invest in a more up-to-date user interface and a higher capacity network. More aggressive social networks such as Facebook eventually subsumed what was left of AOL's user base. The simple message here is evolve as your customer base does. An owner of a radio station observed that 70 percent of the station's listeners were female, 65 percent owned homes, and 45 percent lived in households with income ranging from $25,000 to $49,000. This clear definition of his audience demographics gave him and his advertisers an understanding of their primary market. Value / quality / solutions: These customers tend to make rational decisions and are concerned about budget, durability, and return on investment for their organizations. Reliability / convenience / image: These customers tend to make emotional decisions and are concerned about low buying risk, trust, and prestige for themselves. The relative importance of each of these factors depends on the individual customer, but one thing is certain: customers must have some degree of excitement (emotion) about your product or service if you are going to make a sale. If they don't care, they won't buy. Logic, data, or a rational approach aren't always sufficient to change people's minds; they have to like what they hear. So even a proposal based on logic must have some degree of emotional appeal. We tend to think of people who make decisions based on emotions as those people who show and express emotion. But everyone has emotions - it's just that some people don't show them as often or as openly. Some people base their emotions on logic, facts, or data as opposed to hunches, intuition, or trends, but they still have emotions. They may say something like, "The last vendor didn't meet our quality specifications" or "We count on you to get us everything you promised" or "Reliability is our first priority" or "We always come in under budget." All of these are expressions about what is important to these people or to their companies. They relate to resources, schedules, or deliverables. These people are expressing their expectations, priorities, and preferences. If you don't deliver, they will have a reaction. You can count on it. The majority of business leaders are concerned about such things as quality, due dates, control, reliability, and flexibility. But many also focus on how much they feel they can trust the salesperson's competence, the reputation of the company the salesperson represents, whether people inside their organization will support their decision, and whether their decision will help or hurt their career. Why is it important in sales to know how to appeal to people emotionally? Because no matter whom you are selling to, you have to get to their heart before you can get to their head. Before they are willing to nod their head in agreement, they have to be willing to admit that they like what they hear, are comfortable with the facts or data, and are willing to take the risk - however small it may be - to move ahead. If you neglect to connect with them at their gut level, you may not connect at all. Don't project your way of thinking onto the customer. Ask questions that allow you to determine their preferences; observe the way they like to work; then be consistent with those preferences, and you will find you have greater success making the sale. Here is an example of how well this marketing strategy (identifying who your customers are and why they buy) can pay off. The largest car rental company isn't the one you probably think it is. As I write, the largest car rental company is one that focuses on supplying cars for people who are without their own cars temporarily (such as when their cars are being repaired). They developed and dominate a market that for the most part they don't share with the other car rental companies, because the other companies compete for business primarily at airports. The company is Enterprise. They get 95 percent of their business from local rentals. A big part of Enterprise's market is supplying rental cars for people whose cars have been damaged in auto accidents. They work closely with auto insurers who make the reservation for the policyholder. Enterprise streamlined the rental process for insurers, bringing it online and making it user-friendly. The online system speeds up the process and lowers costs. As reported in CIO magazine, rentals from companies that use the online service have grown at two to three times the rates of companies that don't. Enterprise responded to the needs of these business customers, and in doing so kept itself positioned with its business partners in this market. Here's a quick way to find out what your customer or prospective customer sees as being most important in the buying decision. Use this approach once you know you are talking with the decision maker. Prepare a list of the criteria that should be used in making a decision to purchase your product or service. Don't put anything on the list that you can't do or don't do well. Your list might include six items, for example. Once the customer has listed the items, you can then ask the customer to discuss why he or she considers each one to be important. Where do your products have the best fit (now and in the future)? Which customers do you work best with? What kind of support does the customer want or expect? How much and what kind of communication does the customer want? What does the customer value most (in priority order)? How well are you performing in providing each aspect of what they expect? How well does your account team work to support the customer's needs? "None of us sells anything that anyone needs." Michael E. Gerber, author of Power Point Marketing and The E-Myth, relates this question to brand recognition versus product acceptance. If the customer hasn't been sold on the idea of what you're selling, you must first gain product acceptance. Asking why customers buy can help you answer that question. You've probably noticed that it is usually easier to get people to make a decision if they are already sold on an idea. Selling books to people who don't buy books or read much is a lot harder than selling books to someone who buys a lot of books. Even though at first you might want to sell to the people who haven't bought yet, you will use less time selling if you don't have to convince the prospect why the concept is good. So concentrating on people who are already sold on the product allows you to concentrate on selling the brand, yourself, or what you have to offer, and make sales faster. Richard Olrich a top producer at PW Funding (financing for multifamily housing) provided some thoughts on how he provides value to his clients: "I convey to clients that I am in the business of developing relationships, not one transaction. We give superior speed and service. We're not the most aggressive. We put forth a reasonable deal that works for the borrower and lender. We tend to screen conservatively. We deliver as promised." When he joined the company ten years ago, it did very little repeat business. Now close to half of its business is repeat and a good deal of that is due to the process Richard developed to make sure he "takes away the headaches" of his customers, thus increasing the value of the services he provides to them.
" We have to build a brand that you don't have to keep explaining to your neighbors why your drive a Hyundai and not a Honda." Typically, the most likely customers at the early stage are the small number who must have the latest technology or design. The mass market waits until the technology is proven, the design is accepted, and the product or service becomes very easy to use or is distributed through more convenient channels. This distinction may be important to you if you are selling a product that has not yet gained wide acceptance. While the lack of acceptance can make the sale more difficult, the lack of competition can make it easier. When customers have bought from you, what was most important to them in making their decision to purchase? Understanding this can help you better market to other customers. From time to time, you'll want to ask your customers what was the most important reason they decided to do business with you. What benefits and results have I achieved for you? (Quantify, if possible.) Have I met, exceeded, or not met your expectations? What do you like best about my products or services? About working with me? What one, two, or three things could I do to serve you better? What do you see as the most important trends affecting your purchase decisions in the future? Note also that if you work at a medium-sized or large company, your company may conduct customer surveys. You might be able to gain some information from these surveys, or even piggyback onto them. With hundreds of cable channels, channels are evolving to target more and more specific audiences. Jack Trout, coauthor of Positioning: The Battle for Your Mind, a timeless marketing text, defines this as positioning. Positioning, he writes, is "simply concentrating on an idea - even a word - that defines the company in the minds of consumers." Jack advises that when developing a position in the mind of the customer, it's best to keep it simple: "Just focus on one powerful attribute and drive it into the mind." The more involved and detailed the message is, the more confusing it will be and the less people will understand and remember it. Wal-Mart chose to focus on low prices. When people think of Wal-Mart, they think of low prices. They advertise low or "falling" prices. This positioning became part of the Wal-Mart business model. Kmart, on the other hand, chose to advertise sale items in circulars that were costly to print and distribute and then incurred high costs to stock the sale items. The result was that these costs accounted for 10 percent of Kmart's operating expenses, compared to less than 1 percent for Wal-Mart. The concept of positioning can apply to a company, a brand, or an individual. How do you go about positioning yourself in the minds of customers? Have a field of specialization and be the expert in it. Describe what you do for customers in a way that is easy to remember. Look for opportunities where there is a growing need for your expertise. Have the credentials to demonstrate your expertise. Get the word out about how you help your customers. Positioning yourself as the person to call when someone needs an expert allows you to shift the demand curve so that you're sought after. This is a much better position to be in than having to convince people that they should give you a chance to speak with them. One caution: If you are sought after, don't become arrogant about it. "When something doesn't sell well, I never say, ‘Well, people don't understand it.' If people don't understand it, it doesn't belong in the store." - Reed Krakoff, former head designer, Coach, Inc.
Differentiation determines why one product or service sells for more than another. People ask about price because it is a common denominator and easy to understand. But if people are only concerned with price, it is because they don't see the difference between one product and the next. Price is an important part of most buying decisions, and it has become ever more important. When the economy is soft, price becomes a bigger component of the buying decision than when the economy is strong. With the advent of the Internet, high-speed communication, and data availability, it is now easier than ever to compare prices and features. There has also been an increasing emphasis on driving out costs from businesses as a way to keep prices low and competitive while making a satisfactory profit. But think about it this way. Have you ever bought a product or service solely based on price? Didn't you also consider functionality, ease of use, style, durability, reliability, the reputation of the manufacturer or provider or vendor, delivery time, payment options, trustworthiness of the salesperson, and the guarantee or warranty? Have you ever been offered a product or service that you wouldn't use even if it were free? Was it because it didn't suit your needs? Was it because it didn't do what you wanted it to do? Was it because you wouldn't have the time to use it or didn't like it? Was it because you thought it would be more work than it was worth? Was it because it didn't have the prestige you wanted? Here's a quick example based on my preferences. I read a lot of business magazines. I subscribe to some. Some I receive free as a professional courtesy. But there are some that I refuse to take for free because it's going to take me time to look at it. Based on the value that I perceive I will derive from it, I choose to decline some of these free publications. (The quality of the publication isn't the issue; it's the relevance.) Now, there are others that I purchase. I like to get a good price for the subscription - I won't overpay. I'm sure you and your customers prefer to do likewise. You needed it right away. Your life (or a family member's life) depended on it. Your job depended on it. Your relationship depended on it. It gives you a strong competitive advantage (through advanced technology). Few others have one (it has prestige). The number of times that one will buy something where price isn't an issue is minimal compared to the times when it is. In the vast majority of cases, the customer will factor it in. This is why you need to be sensitive to budget issues. If you ignore budget constraints, you will be blindsided. If everything else is equal, people will go with the lowest price - but how often is everything else equal? And what can you do to ensure that it isn't by differentiating your product or service? Recognize that if you need to justify a price, it is the difference in price, not the total price, that you must explain. And the difference in price can indeed be small when calculated over the useful life of the product or service. Of course, while people may be willing to pay more for the same or a similar item for the sake of convenience or warranty, there is a limit to how much more they are willing to pay. Depending on the circumstances, 5 to 10 percent may be such a small difference that customers won't think twice about it, but 50 percent probably won't be. A client was told during a review after the company had lost a bid, "Your proposal was good, but it was hard to justify that much of a difference in price" - which, in their case, was 45 percent. Everyone wants the best price, but people are willing to work with a reasonable price in tradeoffs against other factors, such as delivery time or track record. One additional viewpoint on price: price differentials on many items occur because of the way they are provided (or positioned). Food is a good example. You can buy the raw ingredients for a meal at the supermarket, or you can pay more for takeout, or pay even more at a gourmet restaurant for the very same ingredients. The price you are willing to pay depends on your tastes, convenience, ambience, and the service level you want and are willing to pay for. A restaurant magazine described how to enhance the perceived value of ice cream as a dessert by the way it is presented - for example, the plate it is served on (the more upscale the restaurant, the larger the plates tend to be, whether or not the portions are), the garnish, the name. (One client said, "Imagine how much of a following sushi would have if it were called raw, cold fish.") Enhanced service is one way to create a positive price differential, provided the customer sees the added service being of value. For sales professionals, the question is, are there additional ways to enhance the customer's perception of the value of what you provide? Is there a different or better way to combine or package what you provide so that the customer will be willing to pay more for what he or she prefers? Can you offer more than one choice? Many times, price is not the real objection. However, when price is the problem, it may be because the customer can't afford the product or service, though the customer may be reluctant to say that. Cash outlay may be the problem, which might be solved by financing or deferred payment. So asking questions to determine whether price is the objection and whether the customer would like to hear about financing options can help resolve this issue. Showing potential cost savings or lost revenues are two other ways of helping to address this issue. Getting customers to say why they don't want to purchase something is more than half the battle. Most people will not say. Why? They don't want a confrontation, they are embarrassed, or they don't want to discuss it or are afraid they'll end up arguing. If you believe price is the objection, try to find out whether your belief is correct. Brian Tracy, CPAE, author of The Psychology of Selling, suggests asking, "If this item were free, would you take it?" If the answer is no, price really isn't the issue. (Again, you can probably think of something you wouldn't take even if it were free, which demonstrates this point.) This might be a time when you could illustrate the point with a story. Have you ever bought something that you thought was a great bargain and that you could use, then took it home to your spouse and proudly showed off your bargain, only to get a response like, "Not in this house"? Was price the issue? When you acceded to your spouse's demands, what were you really selling? Respect for his or her wishes, perhaps? Peace, harmony? What would the real price have been if you persisted in bringing your treasure into the home? Remember that price isn't the same as cost. Price is only the initial outlay. The total cost of ownership includes such things as maintenance, repairs, downtime, and servicing. How does your warranty compare to that of your competitors? What potential revenues might customers lose if they lose the use of the product? What are the consequences of downtime? Making your customer aware of cost savings that accrue from using your product or service can help you justify an initially higher price. And while most want a reasonable price, they also want assurance that the service will work and that problems will not occur or will be fixed quickly if they do occur. Have you ever bought something that saved a little money initially but eventually ended up costing much more? How much did you save on the initial purchase? How much more did it cost you later? If it was a lot of money, isn't it something you would rather not repeat? Can you recall the emotion you felt when you incurred the additional cost? Most people - your customers included - can think of their own examples if you asked them the same question. I can think of a painful one: I "saved" $25, but it cost me $7,500. My wife and I were selling our home, which had a well that supplied our water. The buyer was going to have the water tested, but I wanted to make sure that it would pass inspection, so I decided to have the well inspected myself so I could get any problems corrected, even though I had never noticed any problem with the water. I called the water testing company, which said two tests were available: I could bring a sample of water to them in a sterile container and they would test it for $50, or they could come out and take the sample for $125. I said I thought the $50 test would be good. The representative said that the results wouldn't be certified because they couldn't be sure where the sample came from, but I said that would be satisfactory because the buyers were going to do their own test. That turned out to be a false savings. The sample showed no problems in the well. The day before the closing, the buyer's attorney's office called and asked about the water report. I had forgotten that there was no follow-up test. So someone came out and took a sample. I took the sample from the sterilized faucet in the kitchen, but he took it from the hot water heater in the basement, a damp environment where it would be more difficult to get a clean sample. I tend to believe that he did not sterilize the faucet well. The next morning, just hours before we were supposed to close, we learned that the sample had failed the test. To close, we had to place $7,500 into escrow to cover the cost of a new well, if one was needed - and of course, with the buyer in control, they ended up putting in a new well. We could have not closed, but at that point we felt that wasn't a viable option. To this day, I believe that if I had the fellow come out to take the sample and if he had done it properly, the well would have passed. Asking the prospective customer to answer this question is one of the most important ways of negating the issue of price. You have an advantage when total cost is considered along with all the other results you get for your customers. Customers, whether they are consumers or businesses, have become more price sensitive. We need only look at the popularity of buying clubs, superstores, and discount outlets for proof of this. Businesses are streamlining and looking for ways to cut costs. Cost is an issue we cannot ignore. It's therefore more important than ever to not be considered just a commodity, no different from the next product or service, but to stand out for reasons important to customers. Unfortunately, too many salespeople and too many companies react to the price issue by just cutting price. They condition the customer to expect more and continuing price cuts, resulting in price-conscious and fickle customers who have little, if any, reason to stay with a company because they know someone will come along with a lower price. Why is it that certain products or services must compete more on price than others? In part, it is because they are not distinguished well from those other products or services. But it also may be due to the maturity of the product or service in the marketplace. It is a bit of theory, but the following explanation will put a framework around some of the pricing issues you face and the customer responses you've seen. When products or services are new and address a problem that customers are anxious to solve, they command a premium price; they tend to be in short supply, and demand outpaces supply. Once a product gains acceptance, it also encourages competitors. Those competitors provide alternatives. Those alternatives change what is called the elasticity of demand. The elasticity of demand describes what happens when a supplier changes the price for a product. If there is a high elasticity of demand, when the supplier changes the price - even a small amount - it greatly affects the demand. If there is a low elasticity of demand, when the supplier changes the price it hardly affects the demand. Of course, suppliers like products with a low elasticity of demand. Figure 4 below illustrates these differences between two products, A and B. When the price for product A is increased, demand goes down just a little. People continue to buy the product, but in slightly smaller quantities. So raising the price would probably result in more revenue. When the price for product B is increased, the demand drops sharply. 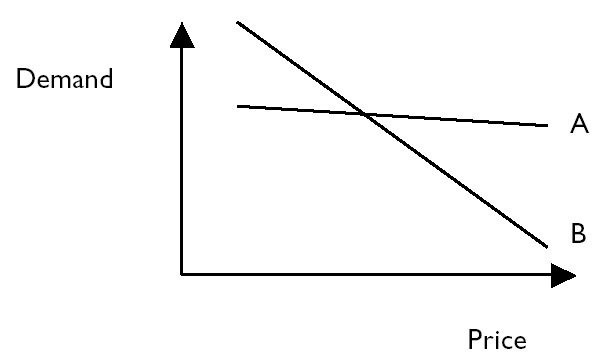 Product B has a higher elasticity of demand than product A. The supplier of product A could conceivably raise the price and make more money, because the cost of the product would probably stay pretty much the same. The supplier of product B, while making more money per unit, may make much less money in total because many fewer units will be sold. The elasticity of demand changes over time, depending on the market and how distinct the product or service is. More mature products or services have a higher elasticity of demand (reflective more of a commodity), which means that the way the product or service is delivered can affect the price. If the market is growing and demand can't be as easily satisfied, then prices tend to remain strong. If the market is static or shrinking, supply will tend to exceed demand, and prices will soften. A good rule of thumb is that the lower the price, the more people will buy. Exceptions are those items that are valued because they are higher priced. Prestige brands fall into this category. There is an element of exclusivity about the brand because not everyone can afford it, so if the price were significantly lower fewer people might purchase it. The other extreme is when the price is so low that it makes people wonder whether there is something wrong with the product. But there aren't too many exceptions to the rule of thumb: the lower the price, the more people will buy. Something else to keep in mind is that sometimes you are competing not against someone who sells the same thing, but someone who is competing for your customer's dollars. Electronic equipment sales were strong until car companies offered zero-percent financing. Consumers chose to buy cars instead of electronics. When the economy is slow, people may not take exotic vacations; they may go out to the movies or restaurants more often. What does this mean for you as a sales professional? It means that if you started out selling a unique product with few competitors, but now find yourself facing more competitors and more price competition, you will encounter more price sensitivity. You will need to differentiate yourself in the marketplace so that customers see you as an important part of their purchase of your product or service. You're going to need to exert care when it comes to pricing. What worked early in the product's life cycle won't necessarily work later. What works when a market segment is strong won't work when it's shrinking. One defense contractor, commenting on the change in the defense budget, said, "Cost is of the essence to the customers, because they don't have the budget they used to." As a sales professional, you don't design the product or service you sell, but you can affect the way you sell it and the value you add to it. Adding a level of service will allow you to compete more effectively against those who have poor service. I've spent a lot of time discussing the issue of price because it is a critical factor in buying decisions. Price is the easiest way to judge a product because it is easy to understand. But price needs to be placed in context. Do what you can to position yourself so you aren't competing solely on price. At the same time, don't ignore the issue. Look for ways to enhance your perceived value. Look for ways to deliver higher value to customers. Do it while lowering their costs, which adds to their bottom line, and they will continue to buy from you. Be clear about who your customers are, what you do for them, the value you promise to deliver, why they should buy from you at what price level, and the results they derive. [*]"Growing Your Company: Five Ways to Do It Right!" Fortune.